Here’s another quick “Guess the Embouchure Type.” Watch this video of trombonist Danielle Elsinghorst and see if you can guess which embouchure type she has. This one is a tough one. My guess after the break. I haven’t done a lot of marching band, so my opinions about it are tempered somewhat by my lack of experiences in this area. Personally, I was always more interested in making music for listening purposes, rather than in conjunction with something that looks cool on the field. Also, I have to admit I’m not much of a football fan, so I never really was interested in going to a lot of games. At the high school and university I went to for my undergraduate degree there wasn’t even a marching band to participate in, we just did pep band and played in the stands. But I do know a lot of musicians who had very positive experiences in marching bands and drum and bugle corps, so I understand the appeal. And I’m trying to learn more about this in order to be able to be more versatile as a teacher. Recently NPR broadcast an editorial about marching bands and sports, which I found very interesting and have some agreement with. Frank Deford mentions his surprise in learning that many schools offer scholarships for students to play in the marching band. I have no problem with this, many schools offer financial incentives to students to play in a particular ensemble for both music majors and music minors. One of Deford’s other points I’m in full agreement with. Lisa Chismire, the parent of a student in the Unionville-Chadds Ford District in Pennsylvania, discovered that it was district policy — as it is elsewhere — to force serious music students to attend band camp in the summer and then march in the band at football games. If music students who had no interest in the marching band did not go along and assist the football program, the young musicians would not be allowed to play in the concert band, the symphonic band, the jazz band or the orchestra. Chismire, who is a retired lawyer, was appalled. She called this “extortion” and “institutional bullying” — coercing students in one discipline to serve as spear carriers for those in another. In my experience, if the marching band is run well by the directors you typically don’t need to spend a lot of time recruiting your band students to participate in it. They will want to because it’s enjoyable. If anything, I feel that the concert band is the ensemble that needs to be the core group of a high school band program and this is the ensemble that should be required for participation in the marching band. It’s in the concert band where the director can most effectively teach essential musical skills that will translate to a good sounding marching band, where the marching band has too many other activities involved to really focus on making music well. But there is some controversy about these different priorities. Many high schools really focus their band program on the marching band. It is the most visible group of the entire music program and is how many school band programs are judged by the general public. The comments in the NPR article are also interesting to read, with good points being made by both sides of this issue. What do you think? Should marching band be the core ensemble of a high school band program or is this putting the cart before the horse? Does the real answer to this question lie somewhere in the middle? I just came across the below YouTube video, coincidentally a couple of days after bringing this research up to Paul T. and not being able to remember the name of the author. Jay Bulen, now professor of trombone at Truman State University, filmed trombonists’ embouchures using a camera and strobe light set up inside the mouthpiece to study the lip motion while buzzing. This video shows the lips of Peter Ellefson, who teaches trombone at Indiana University. One of Bulen’s test subjects, whose name I’ve forgotten, sent me the video footage of his embouchure while I was researching for my dissertation. Because you don’t get to see the embouchure formation from the outside, it’s hard to put these videos into context to determine a player’s embouchure type, but in the case of Ellefson’s embouchure it looks like the upper lip predominates, so his embouchure must be one of the downstream types. Outward striking‐ and inward striking‐reed models have been proposed for representing brass players’ lips [Sanoyesi etal., Acustica 62, 194–210 (1987)]. The models differ in the predicted relationship between mouthpiece pressure and lip displacement. To investigate this, Yoshikawa measured the phase relationship between mouthpiece pressure and lip strain as indicated by a strain gauge taped to the upper lip [J. Acoust. Soc. Am. 97, 1929–1939 (1995)]. However, the relationship between strain and displacement have not been experimentally established, and Yoshikawa’s assumed correspondence ‘‘is still a hypothesis which needs refinement’’ (p. 1931). Optical measurements are required. Synchronized optical and acoustical measurements of a trombonist’s embouchure have been made under performance conditions, using an adaptation of techniques described in Sercarz etal. [Am. J. Otolaryngol. 13, 40–44 (1992)]. Using strobed videoscopy, individual video fields are coordinated with mouthpiece pressure by means of timing signals. The phase relationship between mouthpiece pressure and lip displacement will be reported for a variety of fundamental frequencies and intensities. In addition, estimates will be presented of the aperture area and the mouthpiece volume swept out by the lips.The goal of this informal workshop, a continuation of Session 1aSC, is to bring together several researchers working on various aspects of voice perception. Historically, the study of voice has been treated as a more‐or‐less autonomous area quite distinct from other research problems in speech and hearing sciences. In this workshop, some of the traditional problems of voice classification and perception will be discussed and reviewed and then these efforts will be related to recent findings in speech perception and spoken word recognition which have shown important dependencies between traditional voice parameters and perceptual analysis of the speech signal. Here’s a neat video showing one of J.S. Bach’s “crab” canons. The melody of this piece in retrograde produces a very clever canon. This video by YouTube user Jos Leys shows how this works very clearly, including showing how the melodies line up on a mobius strip. Even though it’s a short piece, it’s really amazing that Bach was able to compose a melody that created harmonious counterpoint when played in retrograde like this. 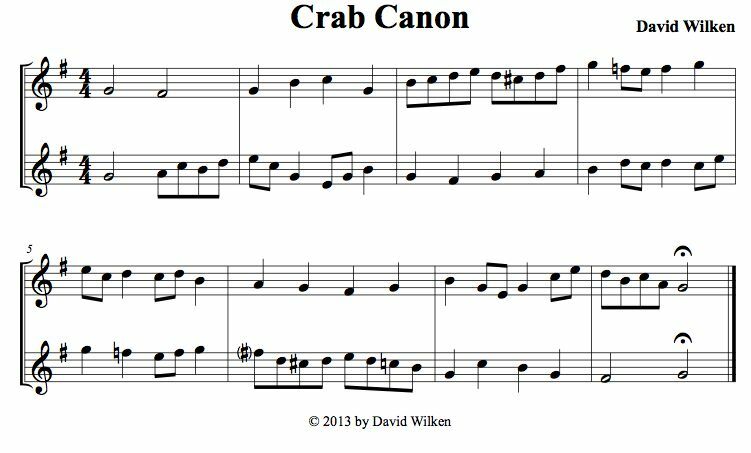 Just to warm up myself to work on a composition project I decided to try writing an 8 measure crab canon myself. You’ve got to keep in mind the harmonic motion must work in retrograde as well as keeping track of the intervals and melodic motion. As I wrote the first measure I went to the end and filled in the bottom part’s final measure and worked a couple of measures this way. Then I worked on composing the bottom part for the first couple of measures and filled in the top part towards the end, modifying the melodies as I needed to in order to make the harmonic and melodic motion fit the rules of baroque counterpoint. The middle four measures were the most challenging for me. I wanted to get away from being completely diatonic here and it took me a little work to get everything to work out. The results, well, not quite as good as Bach’s. Here is what I came up with and a MIDI realization. Try it out yourself as an exercise and see how you do.